Home > Blog > Book Publishing > How Much Does It Cost to Publish a Book? Many authors are concerned with how cheaply they can publish. There is nothing wrong with wanting to save money, but here at Scribe, we cater to authors who have other careers. People like doctors, CEOs, consultants, lawyers, wealth managers, and other high-level professionals who are using their book as a credential to increase their authority, raise their visibility, and be a legacy piece for their career. For them, they cannot afford to do their book cheaply, because if they do, it will make them look bad. They want to save money, yes, but never at the expense of putting out a poor product with their name on it. 2. How professional do you want the book to be? This is an incredibly important factor for Scribe authors. Like I said, our authors are high level professionals with high paying careers. Their time is extremely valuable, so a factor that they must consider is the opportunity cost of their time. Opportunity cost is a concept from microeconomics which says that every action has not just a direct cost to it, but also a cost in terms of the opportunity lost, and you must factor both in when calculating the total cost. Let’s stay with book publishing for an example. If you have a retail job that pays $10 an hour, then the opportunity cost of your time is $10 an hour. But if you have a career that pays you $250,000 a year, given a normal 40-hour work week, you make $125 an hour, and that is the opportunity cost of your time. This difference fundamentally changes the calculation for the true cost of publishing a book. For the sake of example, let’s say you have two options to publish your book. You can do everything related to publishing your book yourself over the course of 100 hours of work, or you can pay someone else to do it for $9,000, and spend no time working on it. For the person making $10 an hour, the choice is clear: 100 hours of work is worth $1,000 to them, which is much cheaper than paying $9,000 to someone else. They should do it themselves. For the person making $250k a year ($125/hr), they should actually pay $9k. For them, 100 hours of work is worth $12,500, so they actually save $3,500 by hiring someone at $9k. Opportunity cost can be tricky to calculate if you are looking to be precise, but fairly simple to ballpark. The point is not to have exact numbers, but to understand the value of you time, and to understand that you should, as a rule, spend your time where you create the most value for yourself. Like I said earlier, most information pieces on the cost of publishing give you the cheapest way to do it. That’s not a plausible path for our clients. If you have a professional reputation to uphold, then using cheap services to publish your book will actually hurt you. The fact is, readers will judge your book. And not just the book; they will judge you as a person based on the quality of your book. This is one of those unpleasant but true facts of life. We all say “you shouldn’t judge a book based on the cover,” but we all do. The more you accept this fact and then adapt to it, the better your book–and thus your career–will be. When evaluating cost, the metric a professional should be using is quality. How can you get high quality at a low cost, not how can you get the lowest cost. To help you see this, as I explain each publishing stage and the cost, I’ll rank the price ranges for each tier: Low Quality, Acceptable, High Quality, Best Possible. It’s not necessary to pay for Best Possible every time, or even for High Quality. Sometimes acceptable is good enough. The key is knowing where and when to save money, and where to spend it, to make sure you get the highest leverage for your money. 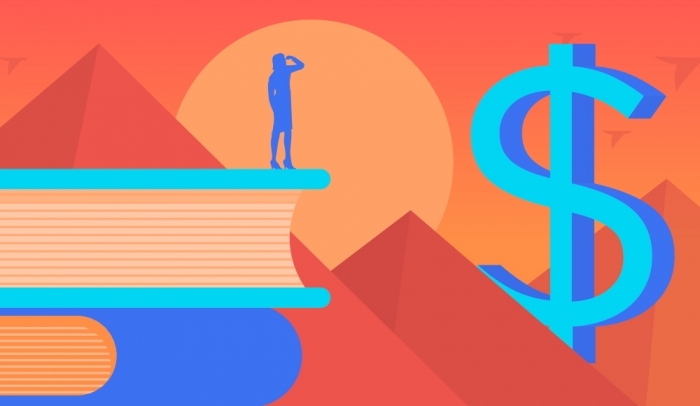 Let’s dive into the actual cost assessment now (note that this piece assumes you’re self-publishing, if that’s not the case, then your costs will change). This is one of those areas that can range anywhere from free (not counting opportunity cost, of course), to well into the six figures. The question here is do you need help, and if so, what kind of help do you want? If you want ghostwriting, that will range from $40k to $100k+. If you want a service more like Scribe Professional turn-key service, it’s $36k. If you want something where you do the typing, but get professional guidance, there is this for only $12k. If you want a writing coach, you can find those as well, and they range from a few hundred to tens of thousands. There are tons of books that can help you, and online courses to take, all of which vary in price from free to several thousand. And of course, you can sit down to write it yourself without any help from anyone. Of all aspects of publishing a book, this is hardest to cost out because it’s so personal. Furthermore, this is one area where price does not always equal quality. I am going to leave this without price reference, but know that there is always a cost here, even if it’s just the opportunity cost of your time. Editing is easier to price than writing, but still not as straightforward as you might imagine. The problem is not just the difference in the quality of editors; the problem is in the wide variation in different types of editing. For the purpose of this pricing, we will assume we’re talking about a full content edit, which is what most authors need after writing the rough draft of their manuscript. Copy editing is easy to find for cheap. The problem is that if you don’t do this right, you will look terrible. When people find bad grammar or misspelled words in your book, they literally think that you are stupid–it’s totally unfair and irrational, but true (think about it, you do it to authors as well). So make sure whoever you use, you pay enough to make sure it’s done. That’s why we recommend at least two different copy editors review your work. The prices below reflect only one, so double whatever it is you use. Copy editing costs are highly variable, but these totals below reflect the total for hourly pay for a 35k-word book. This is something that authors often forget about, but it is crucially important to getting people to actually buy the book. A big part of the buying decision for readers is the book description. Another thing that if you go cheap, it will hurt you. Our breakdown on the importance of the author photo explains this in depth, but the point is simple and easy to understand: people judge you based on your appearance, so make sure to send the right signals. We’ve written extensively how to get a great book cover, and this is probably going to be the biggest cost center you have for publishing. But again–people do judge a book by its cover, and you must get this right. There are two basic ways to print books: print on demand, or commercial offset printing. In print on demand, the printing costs for orders are pulled out of the royalties, so there is no upfront publishing cost. Thus, anything you spend depends on the format. CreateSpace and KDP charge nothing to set up paperbacks. IngramSpark charges $49 for physical book (HC or paperback) setup, and $25 for eBook setup. The quality for IngramSpark tends to be about the same as CreateSpace. Offset printing basically means hardcover. Offset printing is when the books are not printed on demand, but instead run in large batches, which is necessary for high quality hardcovers. These tend to be higher quality, but they do cost much more, if for no other reason than you are paying for the printing of the book before it’s done. It’s almost impossible to quote a price here without knowing the quantity of books you’ll be ordering. For example, 1,000 books will usually cost you between $5 and $7 apiece, whereas if you print 5,000, the price goes down to around $3, and more than 10,000, the price often drops below $2. Furthermore, not everyone needs a hardcover. For this reason, we cannot really include this in the cost of publishing, but know that if you want high quality hardcovers, then you will have to spend money on printing the books. ISBNs are kind of a pain. For most of our authors, there are perks to having their own ISBN (which we provide as part of working with us, of course). The ISBN is the 13-digit number above the barcode at the back of your book; it tells bookstores and libraries all the important info about your book. If you use a free ISBN assigned to you by CreateSpace or IngramSpark, there are downsides. First off, your book looks more self-published. Second, you’ll limit your chances of a bookstore carrying your own book, as many won’t take books from CreateSpace especially. You do not have to get your own ISBN, but doing so will make you look more legit. Again, this is not a true total cost, because writing help and hardcover publishing is not included, but I hope this at least helps you understand what ranges you’re looking at when considering publishing costs. How Much of Your Story Should Be in Your Book?